The Guerrilla phase of the conﬂict began with the battle of Silkaatsnek on 11 July 1900. There were three other engagements on the same day at Dwarsvlei 40 miles to the west, Witpoort 10 miles to the east and Onderstepoort 5 miles north of Pretoria. The British lost the ﬁrst three, putting new heart into the Boer cause. information that the Nek was lightly held; he decided to attack. The Royal Scots ‘Greys’ [cavalry] and two sections of ‘0’ battery Royal Horse Artillery (RHA) were sent to relieve the 1 500 men and two batteries at Silkaatsnek and Commando Nek under Baden-Powell on July 7th as he in turn had been ordered to Rustenburg to support the threatened garrison there. 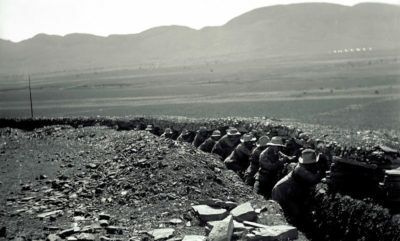 Baden—Powell had stressed that both Silkaatsnek and Commando Nek should be held with a reserve on the Rietfontein hills. This fortiﬁed communications post became known as ‘Baden—Powell’s HQ camp’. On the way to Rietfontein the doctor and the padre of the Greys spent the night in a deserted shop at the foot of Sikaatsnek — the foundations are still visible. It was said to have been owned by a Scotsman who spanned zebras to his wagons. The increasing activities of the Boers on the plain north of the nek caused requests to be sent to Pretoria for reinforcements [Kitchener was now in charge]. Eventually, on the 10th July, ﬁve under strength companies of the Lincolnshire Regiment [of foot] were sent out to relieve the Greys. Three only arrived at the neck in the late afternoon and had barely time to take up positions vacated by the Greys before dark; the Greys could not proceed further west until the next day and had to bivouac beneath the Witkopje. The request for more reinforcements was reiterated. At ﬁrst light ﬁring commenced from the heights above the pass. Under the brilliant full moon (at 03:00), the Boers had climbed up on either side of the nek during the night resulting in the British being caught in a crossﬁre with little opportunity to take cover. The right ﬂank outpost was overrun almost immediately; the left ﬂank was to hold out for a large part of the day with the help of the Greys who were still at the kopje; their horses had been left in the trees by the stream at the foot of the neck and were galloped back to Rietfontein. Two companies of Lincolns were still at the bottom of the nek not having been able to continue to Commando Nek the evening before. With the help of the Maxim they delayed the encircling movement of the Boers from the western side of the nek. The RHA at Rietfontein was advanced across the valley ﬂoor with their 12-pounders, but against the sun, dust and smoke were unable to be sure of their target. The two companies at the foot of the nek were mistaken for Boers, so the guns were withdrawn. A fact not mentioned at the court—martial in Pretoria a few days later was that m’ the rush to take cover the heliograph had been left in camp, so there was no forward controller for the artillery. 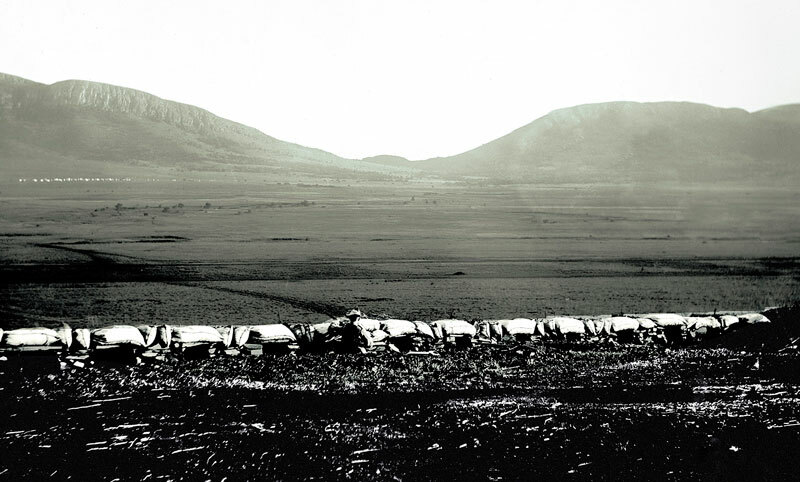 The two 12—pounders in the nek were captured during the morning, hauled away and turned on the defenders with other artillery possessed by the Boers. However this cost them most of their casualties including De la Rey’s nephew, Adj. S J Mussman and Adj. CFF Roth. By late afternoon the Lincolns and Greys were surrounded. They were short of water and ammunition and Col Roberts of the Lincolns, who was wounded, decided to surrender. Both he and the OC RHA were ‘Stellenbosched’, a euphemism for being ﬁred. The main body and survivors from the nek retired along the main road towards Pretoria. About a third of the way they met the belated relieving force coming out, which also turned back. De la Rey probably then occupied the Rietfontein Hills for the next three weeks. Casualties were: — Lincolns 17, Greys 3, RHA 2 — 22 in all who were buried at the foot of the nek. Four died of wounds later and are buried in Pretoria West cemetery. The Boers lost 11 killed who are buried on two farms nearby. One died of wounds on the farm near Skietfontein, half way to Rosslyn three weeks later and one was missing, presumed killed in action.